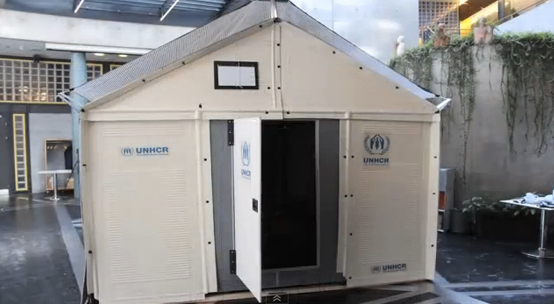 Shelter for refugees is a growing problem in many parts of the world. Of the nearly 10.5 million refugees around the globe, nearly half are children. In 2013 alone, more than two million people became refugees; this is unfortunately a 20-year record. Humanitarian efforts are not enough – the private sector’s involvement is crucial to the well-being of the refugees. Enter IKEA’s “Brighter Lives for Refugees” campaign. The global initiative offers a $1.35 donation to the UN High Commission for Refugees (UNHCF) for every IKEA LED light bulb sold. The IKEA Foundation is the largest corporate donor to the UNHCR and has donated more than $70 million in the past three years. The company has also influenced the view of housing in refugee camps; instead of rows of tents in neat military formation, camps can now be designed more like a village and have a sturdier exterior. IKEA has created a new living structure of 188 sq. feet that can be transported neatly packed in IKEA cardboard boxes and set-up in four hours, just like its famous bookshelves. Each shelter has solar panel roofing so that the dwellers can generate their own electricity. 1. Discuss the importance of corporate responsibility. Ask students their viewpoints on responsibility, and which companies come to mind as being socially responsible. 2. Discuss the benefits to companies as a result of charitable giving programs. 4. Divide students into teams. Have each team select a well-known company and research the level and type of funding provided for social responsibility. 5. Next, have students choose another company (that does not have a charitable giving program) and develop an outline for a socially-responsible or charitable giving program. 6. Debrief the exercise by having each team put their suggestions on the white board.